CHRIST THE SHEPHERD, CHRIST THE KING A musical Easter drama for a large cast and choir. Outlines the life of Jesus from his birth through his crucifixion, burial and resurrection ending on a triumphant note of glory. Suggested songs are separate and no permission to use them is included. Some are public domain and others are not. Directors may wish to substitute songs based on criteria in the director’s notes. CHRIST THE SERVANT, CHRIST THE KING A musical Easter drama for a large cast and choir. Focuses on the servant nature of Christ from the announcement of his birth through his crucifixion, burial and resurrection ending on a triumphant note of glory. Suggested songs are separate and no permission to use them is included. Some are public domain and others are not. Directors may wish to substitute songs based on criteria in the director’s notes. 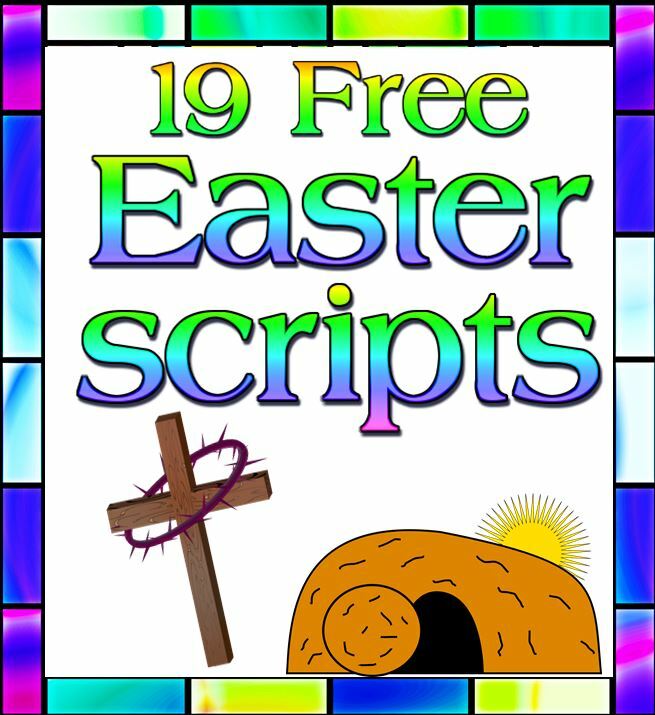 19 Easter scripts and 821 copyright free scripture graphics in one bundle. Download takes some time because of file size.